Going home always starts with the same ordeal, M6 traffic from Cumbria to South Wales! 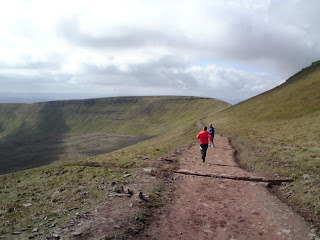 It was in the queue that I had the urge to run up Pen Y Fan the highest mountain in the Brecon Beacons. H agreed that this would be good to blow out the Saturday morning cobwebs. It was then time to convince Neil (my brother). 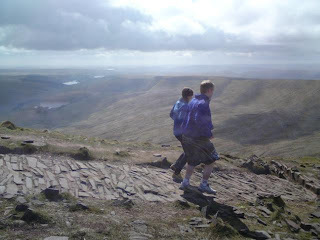 So after much selling it was a 9am pick up to avoid the crowds up the most popular mountain in South Wales. The ascent was more tough as you could see the path all the way up. A small respite on the ridge before tackling some steep rock steps. Then on to the summit. It was quite busy already on the mountain and this meant lots of words of encouragement and looks of 'you must be mad!'. Standing on the summit was unreal, a feeling of personal accomplishment! 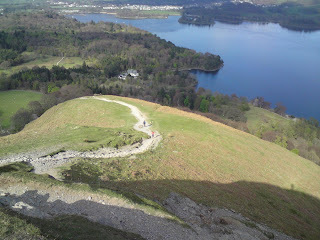 After admiring the view it was time to descend. Back at the car all decided that it was well worth the effort! Bring on the next one! This was a last minute Sunday afternoon decision. 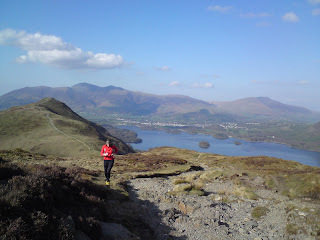 I have always wanted to run CatBells as the view is always stunning from that side of the Lakes. We started at Portinscale for a warm up before hitting the first fell. 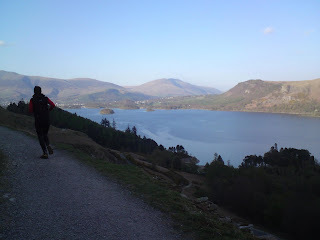 H did not listen to the distance or ascent figures until she asked getting out of the car, this prompted her not speaking to me until we hit Catbells! The ascent was steep but you gained height quickly. 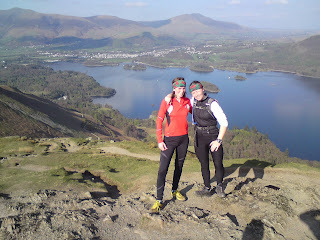 The view over Keswick and Derwent water was stunning and well worth the effort. Soon we hit the top and spent time admiring the view. It was then time to head for Maiden Moor. A small section of descent followed by gentle ascent. Just before the top we decided to drop off the side and explore the steep grassy slope! It wasn't long before we were on the Lake path on the way home. Legs were starting to feel tired now and we still had a fair distance back! back at the car we were buzzing! 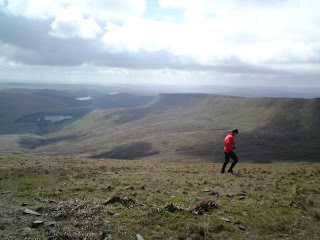 3 hours of great views and physical challenge were an excellent way to spend a Sunday afternoon. 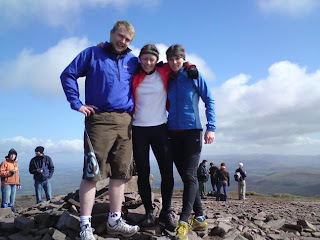 It was decided that Blencathra would be the target after a weekend of work. 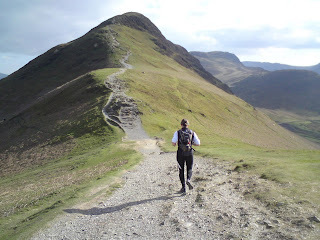 We decided to go the scenic route to Scales Tarn and tackle the steep side to the summit. The first stage was Mousthwaite Comb. After encouragement from the groups on their way up it wasn't long before we topped out on the comb. Scales Tarn was the next target. A welcomed relief along the valley. The ascent to the top was steep from the tarn. Again the view was well worth effort. Getting to the summit is always a great part of the run. After the usual team pic it was time to descend. A great run and excellent views, just what is needed after a weekend of work!